Each month we run a ''Red Club'' and a ''Christmas Club'' - the girls meet once a month to stitch a little project - they don't know what it is going to be until they turn up on the night. 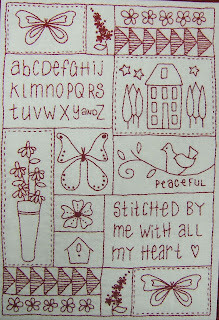 This is what they did this month for the ''Red Club'' - a wonderful Leannes House redwork sampler - judging on their comments at the end of the night, I think I may have unwittingly turned some of the girls into ''stitchaholics''! Many of them had not done any stitchery before that night, but by the end of it, just wanted to go home and keep stitching. But, it's not a bad obsession (passion) to have is it? 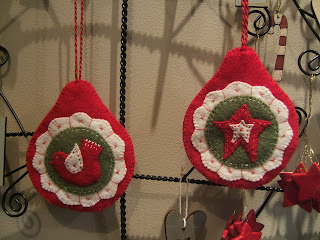 And this is what we did for the first Christmas Club - gorgeous little felt ornaments for the tree, a design of Marg Low. These were amazingly quick and such fun to make. 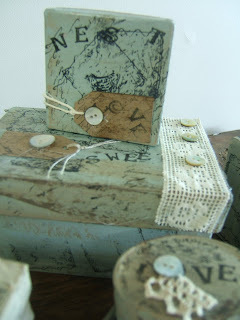 Take a look at these beautiful vintage French bleu boxes created by Barb Smith (http://www.theodoracleave.com/). I have a lovely little selection of these on display. ''Fifi'' is one of Rosalie Quinlan's gorgeous designs - beautifully stitched by Michelle, along with the Needle House (Brenda Rya'n's design) and pincushion and needlebook (Cinderberry Stitches). Susan stitched the cutest little niave mini cushions (another Cinderberry Stitches design). In the background is my ''Matilda's Waltz'''quilt (Brenda Ryan) and a little robin journal made from a button story of Theodora Cleave. Make time to stitch a little every day! I'm looking forward to being able to show you what the girls have been doing, and some of the lovely treats that find their way into The Stitchery. Congratulations on your blog. You'll find it addictive just like stitching and patchwork. Can't wait for the next post. 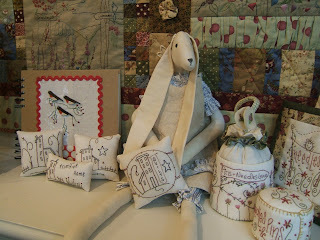 Hi Jenny, Lovely to see a new and interesting blog - I discovered you through Marg Low's blog. Looking forward to returning soon, happy stitching - Tina. Finally did it hey !!!! Looks & reads just wonderfully. Hi Jenny, Just caught up with your new blog. Lovely, well done. Great photos.